After my first visit to Gallipoli in 2009, I was invited by the San Francisco Bay Area Chapter of the old Great War Society to make a presentation about what I had discovered. I knew that my conclusions were going to surprise the members. After my visit, I had reversed my view that it was the great "missed opportunity" of the war. Instead, I became convinced that the Dardanelles Campaign was doomed from its inception – that the naval assault had been a much tougher nut to crack than I had previously believed and that the subsequent land campaign, initiated after the failure of the battleships, never had a chance. This is a Google map of Gallipoli and the Straits with some of the better known landmarks identified. It has been rotated almost 90 degrees counterclockwise for this discussion. To support my argument – almost all of which was based on geography – I felt I needed something concrete so I could share my sense of shock at how different the terrain was from what I had visualized after my readings about the campaign and viewing many of the famous photos all of those present at the meeting had seen. I found my solution just by looking around San Francisco Bay. The southern part of Marin County, on the other side of the Golden Gate, is close in scale and shape to the Gallipoli Peninsula, sharing many of its features: bays, beaches, cliffs, highlands, plus its own mountain peaks, the most famous and tallest being Mt. Tamalpais. A number of these features are shown on the Google map of the Bay Area above with their Gallipoli equivalents. Next, I found a nice user-friendly tourism map and created a slide, overlaying the Gallipoli sites as close to scale as I could place them. Some tugging and stretching was required, but overall, there seemed to be a good fit. 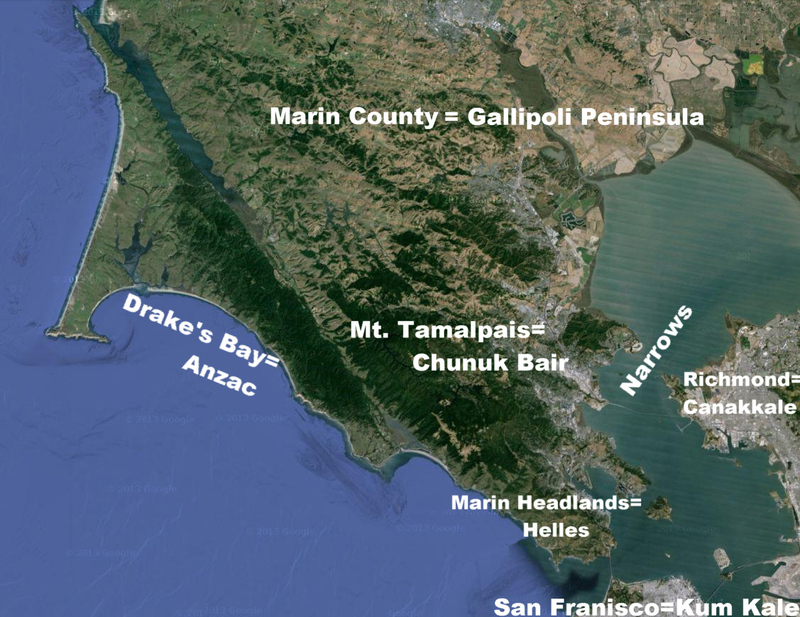 The biggest shortcoming of the slide is that the mountains of Marin are not in the same alignment with the beaches as those on Gallipoli, although not so far out of kilter as to undercut the main points I wanted to make. The most important aspect of this image is the mileage scale. 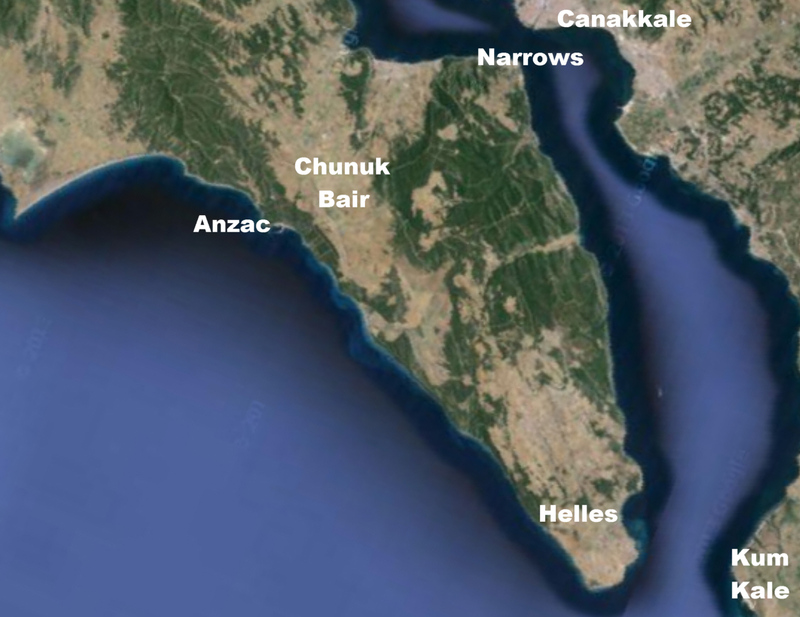 Note that the landing beaches at Helles seem closely clustered but are actually miles apart, and the considerable distance of the Anzac landing site from the Helles beaches. 1. Given the terrain and distance apart, the two initial sectors, Cape Helles and Anzac, were never able to support one another. This violated the "concentration of forces" rule of warfare. 2. Initially, the five landing beaches on Cape Helles presented a similar situation with forces unable to mutually support one another. This led to a delay in any organized effort to break out from the beaches, giving the Turkish defenders a chance to reinforce their defenses. Thus, the defenders very early were able to block any advance by the invading forces, and for the remainder of the fighting as well. The operation at Helles was ill conceived and a failure from its first day. 3. The initial French landing at Kum Kale was simply a wasted effort. 4. The initial plan at Anzac was also unfeasible, requiring forces to land, reconnoiter, climb up steep hills, the highest nearly a thousand feet tall, and hold them with sufficient forces to resist any counterattacks. U.S. Marines at Iwo Jima, for example, required four days to secure Mt. Suribachi in 1945. At Anzac, a comparable achievement would have been needed on the first day. Additionally, in terms of manpower, the Anzac landings were on a shoestring. Had the first troops taken the high ground on Day One of the invasion, the local commander, Mustafa Kemal, could (and did) bring more men, more quickly to the critical point. 5. Summarizing points 1-4: the initial assault of 25 April 1915 was doomed to failure. But what about the August 1915 assault at Suvla? Most histories indicate this effort was well planned but was a failure because the sector commander, Lieutenant-General Sir Frederick Stopford, was incompetent, failing to move with alacrity to seize the surrounding high ground. 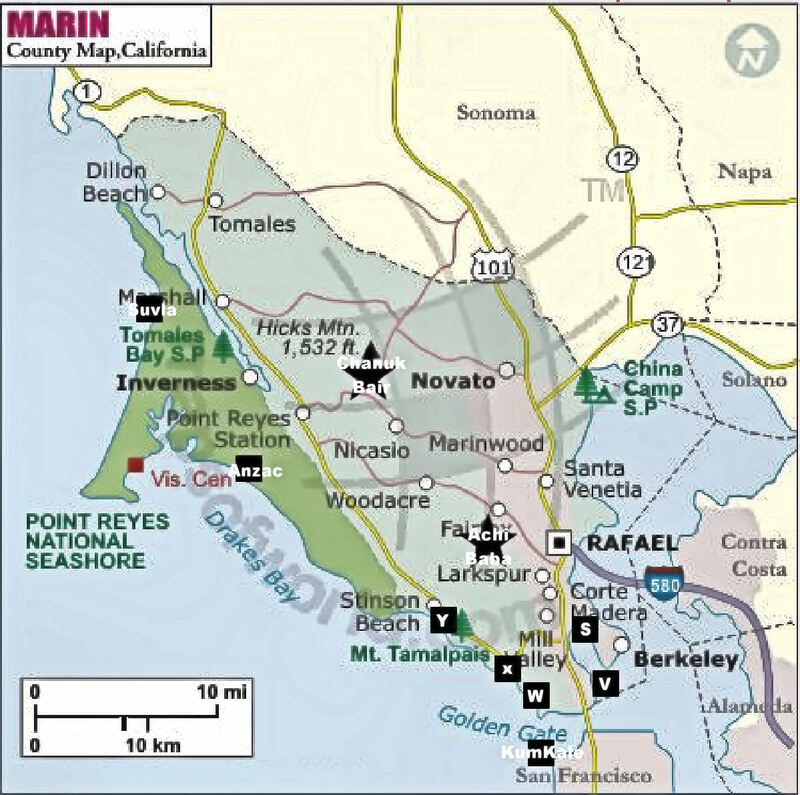 The composite map does not make a contrary case alone, but a drive around Marin County does. Just like at Marin, the hills nearest the sea (the Aegean) at Gallipoli lead to a succession of higher hills, culminating in the Sari Bair massif. The attacking forces out of Suvla – had it succeeded to capture the lower surrounding hills – still had a tremendous series of well-defended near-mountains to ascend. Turkish reinforcements arriving on the scene would have been deployed on those and halted any advance as the local commander, Mustafa Kemal–once again–could (and did). 6. From the above, I concluded (and still do) that the objectives of the Dardanelles Campaign were never achievable and the lives and resources committed to achieve them were wasted. Responses welcome. The trouble with declaring that the resources were "wasted" is one of perceptions. All warfare is essentially attritional, and any resources used (physical or psychological) will eventually be rewarded by the successful belligerent. If France and Britain had resources to soak up Turkish and German resources in the Levant, then they were not _eventually_ "wasted." Think of it another way: much of war is like looking for lost keys, in that everywhere you look is wasted until you find them. Every warm body, every round of ammunition, ever ounce of fuel is thus "wasted" before eventual success. Gotta think long-term. While I have to agree that Gallipoli looked like a waste of resources, where else would they have been sucked up? Western Front? To what account? Mike, this is one of my favorite Great War Society/WW1HA presentations ever. The presentation of information about the terrain and the battle was excellent, but using Marin County as a "parallel geography" made it possible for all of us to immediately visualize the geographical comparisons in an impactful way, since all of us locals know Marin geography but few have been to Gallipoli.